CDE informs and advises partner institutions on a wide range of sustainability-related topics. Our customized services support our clients in aligning their operational and strategic goals and activities with the UN’s 2030 Agenda for Sustainable Development. In our consultancy work, we identify conflicts and synergies between the various goals and targets of the 2030 Agenda and propose solutions and transformations that enable broadly anchored sustainable development. In addition, we advise and support public and private partners in Switzerland and abroad in developing individual and institutional capacities. 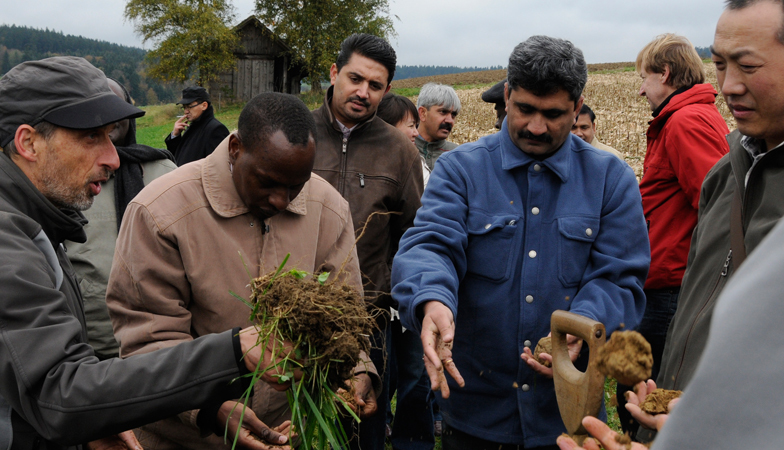 This includes the creation of tailor-made training modules on topics such as geoinformation technologies, remote sensing, climate change adaptation, sustainable land use, food security, rural extension methods, multi-stakeholder processes, poverty reduction, and inequality. CDE’s clients include the Swiss Agency for Development and Cooperation (SDC), The World Bank, regional development banks, the Food and Agriculture Organization of the United Nations (FAO), the German Gesellschaft für Internationale Zusammenarbeit (GIZ), Helvetas Swiss Intercooperation, the Syngenta Foundation, Women Engage for a Common Future (WECF), as well as the Swiss State Secretariat for Economic Affairs (SECO), the Swiss Federal Office for the Environment (FOEN), and the Swiss Federal Department of Foreign Affairs (FDFA).